If you're on a mission for a casual yet stylish getup, dress in a Caslon cotton modal knit elbow sleeve tee from Nordstrom and black denim shorts. Both pieces are totally comfy and will look fabulous paired together. Kick up the cool of your outfit by finishing off with black leather ankle boots. 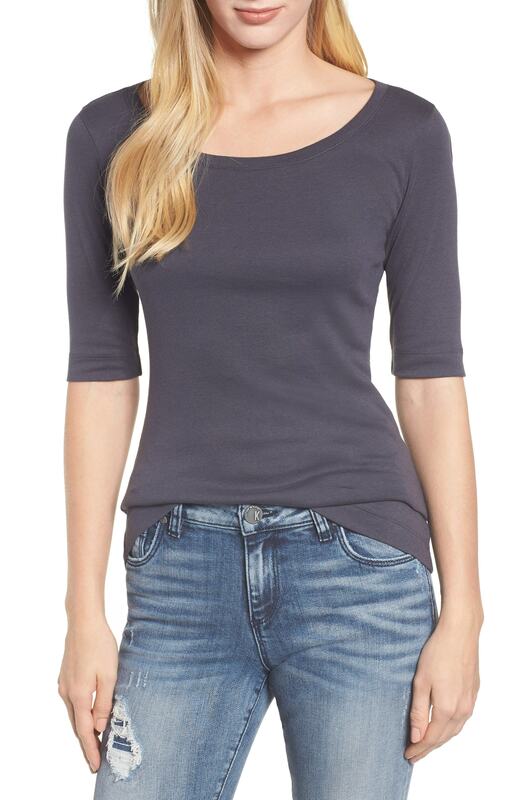 This combo of a Caslon cotton modal knit elbow sleeve tee from Nordstrom and black skinny jeans is the ideal balance between fun and totally stylish. If you're on the hunt for a casual yet totally chic ensemble, choose a charcoal crew-neck t-shirt and black skinny pants. Both garments are totally comfy and will look fabulous together. Sporting a pair of black suede ankle boots is a simple way to add some flair to your getup. Team a charcoal crew-neck t-shirt with light blue ripped skinny jeans to be both knockout and relaxed. Up the cool of your getup by completing it with tobacco leather ankle boots. Rock a charcoal crew-neck t-shirt with light blue ripped boyfriend jeans if you're on the hunt for an outfit idea for when you want to look casually cool. 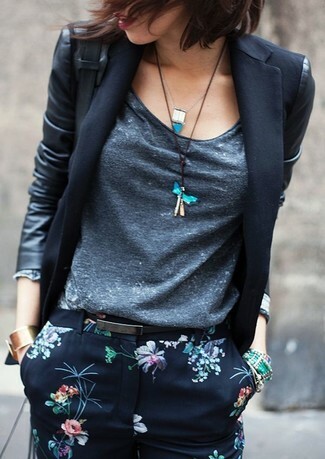 Rocking a pair of black leather pumps is a simple way to add some flair to your outfit. If it's comfort and functionality that you're seeking in an outfit, opt for a Caslon cotton modal knit elbow sleeve tee and navy floral skinny pants. If you're all about relaxed dressing when it comes to fashion, you'll love this adorable pairing of a Caslon cotton modal knit elbow sleeve tee and navy ripped boyfriend jeans. Sporting a pair of tan leopard pumps is an easy way to add extra flair to your getup. If you're searching for a casual yet totally stylish getup, try pairing a Caslon cotton modal knit elbow sleeve tee with light blue flare jeans. Both items are totally comfy and will look fabulous paired together. A Caslon cotton modal knit elbow sleeve tee and black ripped skinny jeans is a great combo to add to your casual lineup. To add oomph to your getup, complete with black suede loafers.